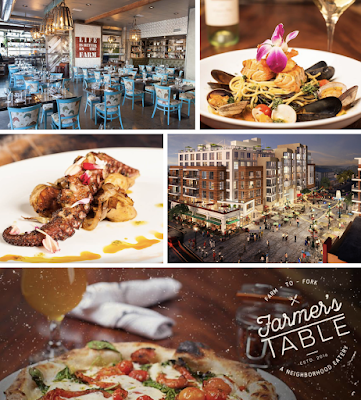 Heading into the last available restaurant space within Little Italy's incoming European-style town square Piazza della Famiglia is a second San Diego location of Farmer's Table, an Italian country-style farm-to-table restaurant and bar with a location in La Mesa. Farmer's Table is a restaurant concept from two established San Diego chefs and restaurateurs - Alberto Morreale and Vincenzo Loverso. A dominant figure in San Diego’s vibrant restaurant scene, Alberto co-owns the Hillcrest and Liberty Station Fig Tree Café locations and is the owner of Farmer’s Bottega in Mission Hills. Vincenzo holds an extensive pedigree, currently serving as the owner of San Diego Dining Group, which operates Greystone The Steakhouse, Osetra The Fishhouse, Osteria Panevino, and a soon-to-be American gastropub where Chianti restaurant is currently located in downtown San Diego. The powerhouse culinary duo opened the original Farmer's Table in La Mesa Village early last year. Serving as the cornerstone of the Piazza della Famiglia mixed-used project, the new Farmer's Table will be located in a premier 7,000 square-foot space, offering a décor that presents a tasteful arrangement of rough-hewn, vintage details using mostly reclaimed materials, as well as a private dining area and an expansive wraparound patio. The restaurant will be the focal point of the 11,000 square-foot Piazza, located directly on Little Italy’s main thoroughfare with a clear vantage of the San Diego Bay. Expect breakfast, lunch and dinner menus based around fresh, locally sourced organic ingredients and unique recipes with an Italian influence, as well as a full bar. The restaurant will also feature a Stefano Ferrara pizza oven imported directly from Naples. Farmer's Table is expected to open at 550 West Date Street in the heart of San Diego's Little Italy by this Spring. For more information, visit farmerstablelamesa.com.